The average for cannabis use in the European countries surveyed was 16%. That was lower than the comparable figure for Spain - 27%. Cannabis was far more readily available than other drugs such as ecstasy or cocaine. The report found no correlation between anti-drugs legislation and the cannabis data. "Trends in cannabis use indicate an increase in both lifetime and current use between 1995 and 2015, from 11% to 17% and from 4% to 7%, respectively," Espad said. Espad is short for European School Survey Project on Alcohol and other Drugs. The results showed large differences in cannabis use among European countries, with an upward trend in Bulgaria, Greece, Poland and Romania, among others. The proportion of students who started daily smoking at an early age - before 13 - fell over the 20 years from 10% to 4%. 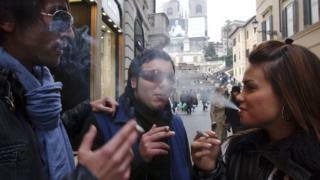 Alcohol use among European teenagers remains high, the report said. But lifetime use in 1995-2015 fell from 89% to 81%. Nordic countries - but not Denmark - were among those with the lowest alcohol consumption among teenagers. High alcohol rates were found in Austria, Bulgaria, Croatia and Hungary. New psychoactive substances (NPS) - not generally controlled under anti-narcotics laws - "seem to be more commonly used than amphetamine, ecstasy, cocaine or LSD," Espad says. NPS chemicals imitate the effects of illegal drugs. Students in Estonia and Poland (both 8%) were the most likely to have experiences with NPS. The European average was 4%.